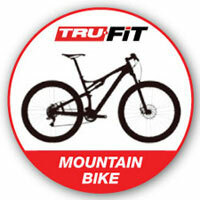 While most don’t realize it, mountain bikes come in a variety of different sizes. Even the most subtle change in size can have an effect on the way you ride. When you’re blazing through winding trails, it’s important that your bike fits you like a glove. Even the most seasoned riders may find that small changes can dramatically improve comfort and efficiency on their ride. Bikes are made up of numerous parts and manufacturers can list sizes very differently from one another. One manufacturer may give detailed measurements of the frame while another may simply list a bike as small, medium, or large. Essentially, the fit of a bike comes down to its frame and the components you touch. The relative positions of the seat, handlebars, and pedals will affect how you accelerate and control the bike. When you are shopping for a new bike, there are a number of things to consider prior to making your decision to ensure that you ride comfortably and to the best of your abilities. The height of the seat tube is the first thing you should look at. This tube holds the adjustable seat post. You should be able to stand over the bike and have room to move. With a leg on either side of the bike, you should have an inch of clearance, at the minimum, from the top horizontal tube. Anything less than that can lead to some unpleasant injuries. On the other hand, too much clearance may mean that you won’t have enough height to adjust the saddle accordingly. After finding a bike with the proper seat tube height, it is time to adjust the saddle. The saddle height is something that needs to be adjusted straight away, as an improperly placed saddle can lead to bad performance and injury. To properly adjust the seat, sit down and let one leg hang down freely. With your hips square to the front of the bike, adjust the seat so that your heel touches the pedal when it is all the way down at the bottom of the stroke. You should be able to pedal with a slightly bent knee. If your leg is straight when you pedal, you’ve gone too far. Pay close attention to how you sit as you pedal. If you find that you are tilting from one side to the other with each stroke, you need to raise it more. When it comes to the actual position of the saddle, it’s a good idea to keep it level. High-end bikes with a tilting seat are great for adjusting based on your riding preference. Some riders choose to tilt the saddle back for tricks. However, a perfectly level seat is the best option for most riders because it keeps your pelvis on a flat surface. The top tube extends from the middle of the seat tube to the head tube, which holds the handlebar stem. This is an important measurement to consider and is often used by manufacturers to dictate size. The problem, however, with set sizes is that not everyone’s arms are the same size in relation to their height. The top tube has a slope, so you shouldn’t be worrying about its actual length. Instead, the measurement from the seat to the handlebar stem is most important. A good rule of thumb is to measure the distance with your forearm. By placing the elbow on the tip of the seat and extending the forearm and hand toward the handlebar stem, you can find a bike that will provide you with superior control. 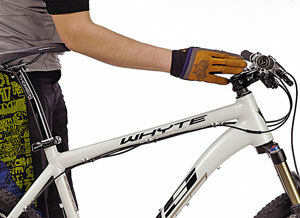 Your longest finger should lie somewhere between the head tube and center of the handlebars. When you ride, your arms should have a slight bend. This decreases the chances of injury and provides you with better control. The perfect fit also allows you to keep your shoulders relaxed. Many manufacturers have top tubes that range from 13 inches to 22 inches. These sizes are generally considered to start at XS and go up to XL. 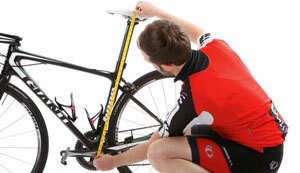 However, you should measure the bike based on your own body to get the best fit. The right height of the handlebars is considered to be more for personal preference and riding style. 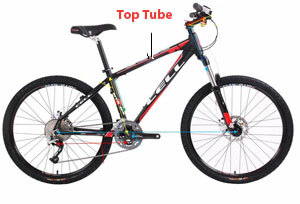 The height of the head tube and handlebar stem can affect the height, in turn affecting your control. Many riders prefer to keep the handlebars at the same height as the saddle. However, others may choose to keep it higher or lower. A lower position provides a more streamlined position that is perfect for long rides on smoother terrain. A higher position can make the handlebars easier to move, which is why it is popular with novice riders. However, this position removes weight from the front of the bike, preventing the suspension system from working properly as you ride on rough terrain. As a rule of thumb, it’s a good idea to keep the handlebars at a similar height to the saddle. However, you can make changes to suit your particular riding style. While you may be faced with a bevy of different sizing options, your best bet is to sit on the bike and see how it feels. Use those sizing tips to narrow down your options. Then, make adjustments, take a seat, and find the bike with the perfect fit. Not all manufacturers use the same sizing guidelines. While many use the top tube as a reference, different configurations and sizes of the seat post, handlebar stem, and head tube can create minute differences that change the way the bike feels and moves. In fact, you can easily find a great fit with multiple different frame sizes. You may find that two different sizes on opposite sides of the spectrum give you what you need. At the end of the day, forget about the given size of the frame and try out different options. Understanding how you ride, what measurements to look for, and the proper position will make it easy to find a mountain bike that fits you flawlessly.